The word “Niagara” is derived from the Iroquois Indian word “Onguiaahra” meaning “the strait”. 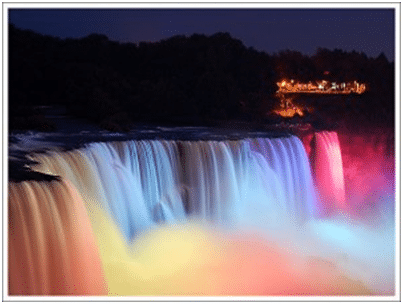 Niagara Falls, well-known for being one of the great natural wonders of the world as they display the sheer force of Mother Nature in unforgettable fashion. Niagara Falls is the collective name given to three waterfalls that straddle the international border between Canada and the United States; more specifically, between the province of Ontario and the state of New York. 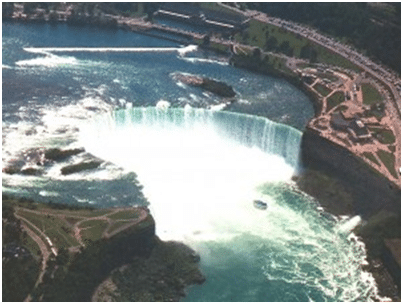 The Horseshoe Falls lie on the Canadian side and the American Falls lie on the American side, separated by Goat Island. The smaller Bridal Veil Falls are also located on the side of American part, separated from the other waterfalls by Luna Island. HOW THESE NIAGARA FALLS FORMED? These Falls were formed about 12,000 years ago, soon after the formation of the great lakes. Great Lakes were formed as a result of melting glaciers. Soon, a connection developed between Lake Erie and Lake Ontario which formed a river. At a particular place along this river, the flow of water falls over the cliffs of the Niagara Escarpment and as a result, Niagara Falls was formed. More geologically, the formation of The Falls is a slow process that continues today. The annual freezing and thawing of the Niagara River still wears away at the rocks under the surface. 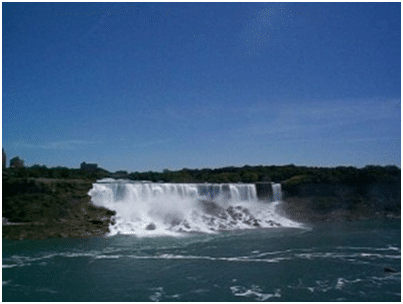 Gradual erosion and periodic rockfalls steadily move Niagara Falls farther upstream. However, modern influences have caused the falls to wear away less quickly. Remedial work has been done to preserve the falls and the volume of water has been reduced by diversion for hydroelectric power. If we talk about the freezing of these falls, the tremendous volume of water never stops flowing, However, the falling water and mist create ice formations along the banks of the falls and river. This can result in mounds of ice as thick as fifty feet. If the winter is cold for long enough, the ice will completely stretch across the river and form what is known as the “ice bridge”. This ice bridge can extend for several miles downriver until it reaches the area known as the lower rapids. 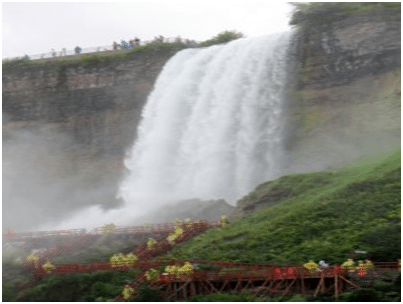 The Falls are visited by around 30 million people every year, so from the count, you can analyze that it’s a well-known tourist’s place and many people plan for Niagara Falls tours. In 2012, Nik Wallenda became the first person to cross the Niagara Falls by tightrope in 116 years. He was allowed to do so after receiving permission from both the Canadian and United States governments. It is said that 50,000 years from now, there won’t be a falls anymore, but there will still be a river at work because of the present rate of erosion. These Falls are renowned both for their beauty and as well as a valuable source of hydroelectric power. These falls are worth to be seen so definitely go and there are plenty of Niagara Falls hotels nearby. If you have been to these falls, do share your valuable experience.